The widget displays the graphic representation of one signal compared to a maximum value chosen by the user. By moving your cursor over the data area, you will see balloons containing the value and its corresponding date. if the signal has values substitutions set, graph area has the substitution color, otherwise it uses the widget color. If the substitution is active, the color of the widget updates according to the color set in the substitution. By clicking on the 3-dots icon, you access the widget menu, then, by clicking the gear, the editing modal. 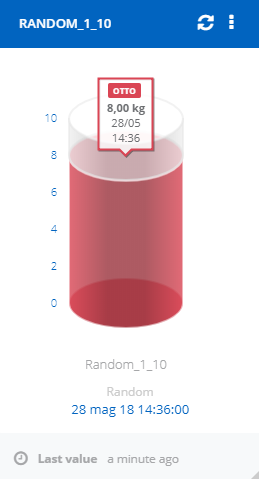 In addition to the color of the widget, it is possible to choose the maximum value, set a text below the graph (signal description is used as default) or view percentage values. The displayed data and reference date can also be choosen (for example, Hourly Average shows the last availabe hourly average). The Custom avg option allows to select the reference date range and the type of source data (All values, hourly averages, daily averages, weekly averages, monthly averages), the value represents the average of the signal in the selected period calculated with the selected type of data. If the displayed data is note set to Last value, it i possible to choose whether to show the maximum, the minimum and the deviation from the average of the selected period.